I cannot imagine for one moment I should be the only resident to write to you on this matter. It was interesting to meet with the representatives of the latest debacle to befall the redevelopment of The Spanish City last week at what was purported to be a ‘Community Consultation Event’. Sadly the attitude of those present made it more of a fait accompli than a consultation. The location of the proposal is not conducive to the area and the community. This area is currently being redeveloped in a most sympathetic way. Over the summer this has provided an excellent venue for mini festivals and community events, which have benefited the community immensely. This would no longer be possible with the siting of an hotel and restaurant. There is already a Premier Inn at Holywell, which is only three miles from Whitely Bay. I question whether there is enough footfall to warrant two of these in such close proximity. 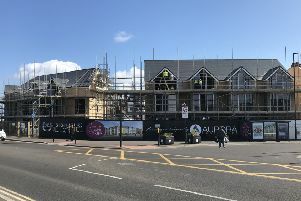 However, should the client decide that the likely footfall makes Whitely Bay a worthwhile site, then why not choose one of the brownfield sites available that have previously sited hotels, namely The High Point, and also The Avenue – the access, the services and the footprint already being available? Why destroy a perfectly desirable and useful area when alternatives are available? It was cited to me that this would bring business to the area. I am not convinced of this at all. Currently, we have three large hotels in the area, which provide facilities on a tariff to suit a range of clients. Of these, none of them is permanently full, so where is the additional business coming from? On top of this we have a range of B&Bs – surely a budget hotel would threaten the business they provide. Furthermore, the typical client of a Premier Inn chooses such an establishment as somewhere simply for an overnight cheap stay. Its typical clientele are unlikely to patronise local restaurants and shops. So I am at a loss to understand how a budget hotel would benefit the area. The area is predominately built with Victorian architecture. The more recent buildings have been built with what could be described as a sympathetic style. The proposed design for the Premier Inn is, without question, at odds with the surrounding area. The Spanish City is an iconic building, which is recognised nationwide; synonymous with Whitely Bay. To build such a new building right next to it would destroy the vista. I applaud and welcome redevelopment of our town, but it has to be right, it has to add value and it has to be sensible – this on so many levels is just madness. I do hope that at some point sense prevails and the powers that be at North Tyneside Council, who, by the way, should remember they are civil servants and perhaps reflect on their titles, do the right thing and stop this monstrous proposal before any more time and money is wasted.